, four women meet for breakfast - and to talk. To tell their stories, recount their sorrows and their joys. To offer each other encouragement and unstinting support. has just been through a devastating divorce. She's driven by anger and revenge . . . until she learns something about her ex-husband that forces her to look deep inside for the forgiveness and compassion she's rejected - and for the person she used to be. is widowed, in her late fifties, a successful professional - a woman who's determined not to waste another second of her life. And if that life should include romantic possibilities - well, why not? is in her twenties, the years for taking risks, testing your dreams. dream is to be an actor. So what if her parents think she should be more like her sister, the very respectable Victoria? is turning forty this year. Her husband's career is established, her kids are finally in their teens and she's just started her own business.Everything's going according to plan - until she gets pregnant! This is Debbie Macomber at her finest. Meet Julia, Karen, Liz and Claire - four very different women facing very different problems. They meet at a writing class but continue meeting up every Thursday morning at eight. Julia is a happy mother-of-two who has just opened her own knitting shop. What could go wrong? An unexpected, and unwanted pregnancy. Karen is in her twenties and has been pursuing an acting career for as long as she can remember. But her mother does not approve. In Karen's opinion, her mother wants her to be like her sister Victoria. Except, Victoria does not have it all worked out, and very soon relies on Karen to help her out of a terrible situation. Liz is a widow. Her husband died unexpectedly. Just when the grief had lessened, her two children move away, leaving her even more lonely. And then she begins to be pursued by a handsome doctor. Is she ready to date? Does she want to be involved with this arrogant man? And Claire. She had been through ahurrendous divorce. Her husband left her for a younger model - leaving her hurt and angry. But through her son she discovers what her ex is going through. She is about to learn there is a fine line between love and hate. This was a great book, I really enjoyed it. It was easy reading, good chick-lit, but with some deeper issues. Macomber explores cancer, death, premature births and domestic abuse. And in my opinion, she did it well. In some cases, there were no happy endings, which is realistic and made the book more inviting. There were extremely sad moments, moments were I was shocked by the abuse, worried about the baby and cheering on the characters as they walked down paths of love and forgiveness. With all these issues I think Macomber did a great job. I really liked how this was based on the author's own life. She has a network of friends that she meets up with regularly. Although the characters and events are fictional, there was an added dimension knowing that it was based on personal experience. All the characters were great. I connected with all of them on different levels and found myself hoping and wishing for them, and experiences their emotional hardships with them. They all had a different story but they way they helped each other was lovely. This is ultimately a book of friendship, and it is just lovely. I did feel that some of the characters were not featured as much as others, which was a shame, however, they did cross into each others stories to knit the narrative together. 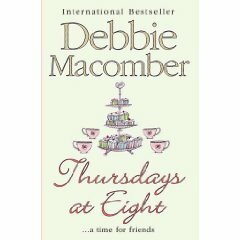 And speaking of knitting, it was interesting thatMacomber included that hobby in the book, especially in the form of a knitting shop, as her Blossom Street series also revolves around a knitting shop. Overall, I just really enjoyed this book. It is a book of friendship and companionship. It is easy to read, well written chick-lit. Kate, thanks for an interesting and in-depth review. I've not read any of Macomber's books before, but your description of this one has me intrigued. I'll be on the lookout for it when I hit the book shop armed with my birthday gift certificate from my grandson. On a side note: Debbie Macomber periodically sends out a newsletter to her fans (maybe quarterly, I'm not exactly sure), and a good friend of mine who's a fantastic illustrator (and a published author herself) does the banner artwork for Debbie. Sounds like a temptingly good read Kate, having read the Blossom Street ones, a must for a wish list I think. Maggie you must try the Blossom Street ones, a few of us on here have read them.